I joined Cotton Robin. I participated in the first round of this swap a couple years ago and loved it. I finished my center block, just need to pack it up and send it to the organizer. No picture, because it's supposed to be a surprise. Orca Bay was the Quiltville Mystery 2 years ago. 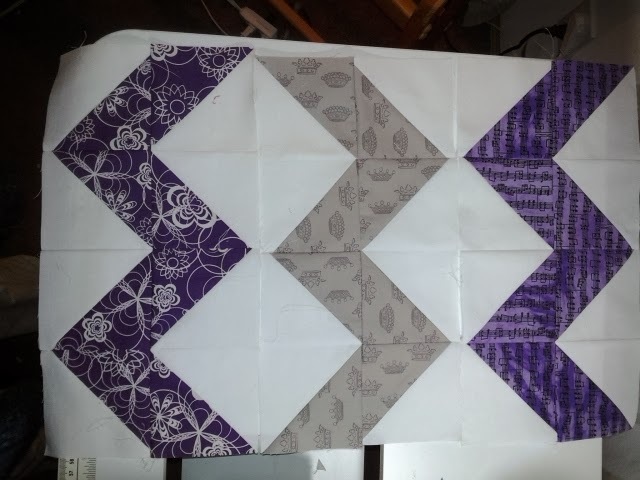 I made all the blocks, split them in half and finished a lap sized one. I've got the blocks to make a second, which is good, because this one was a gift for a friend. I ADORE scrap quilts, and the itty-bitty pieces. I also made 3 blocks for the Block Lotto. I've been following even though I haven't been participating for a couple years. My favorite colors and shapes. After much thought, I've decided to limit Sew Chaos to sewing and cooking. All of my "writing" will be moved and posted to the sister site, Distilled Chaos. More than a few people have commented (in person) that they enjoyed reading it, and also more than a few commented that the "sew" part of the title no longer described the content of the blog. So, if you like the writing, click the link, that's where it will be from now on. If you prefer the crafty stuff, it will still get posted here, on the rare opportunities I have to sew and craft. In the next few weeks I'll be moving the relevant posts from the old blog to the new one.